The fair is over, people have gone back to their daily routines. Now, what did we take home at the end of the day? We showed the name “Mageia”. The visitors who came by were informed by our people at the booth and the text of a large poster. Questions were not so much about the technical side but rather in the area of who we are, what we are and (and not least) why we are. This was an initial introduction to the Germans and it was received nicely by those who asked. Something the German Mageia community can build upon during the time and the events to come. We had the opportunity to introduce Mageia in detail by a conference held by ennael. There wasn’t a large crowd but we did not expect that anyway, there were too many conferences at the same time (more than 230 in 4 days!). Still, those 20 people in the audience were a start. One of the most important benefits of this event was meeting face-to-face. We were able to discuss many things directly, especially people who are working very close together, like rda and obgr_seneca (for example). We can look forward to all the nice things they are planning! When looking at the pictures (see next paragraph) you will recognize we offered black and white Mageia T-shirts. These T-shirts are special – they are the T-shirts made for our first official appearance at FOSDEM 2011 and you will never again have the chance to get one of them! We offer black and white T-shirts, all sizes. German orders please contact wobo AT mageia DOT org (price in Germany will be 10 Euros including shipping). For international orders people in Paris will soon set up a way to facilitate purchasing those T-shirts. We took some pictures and I will upload them to the Mageia gallery in facebook ASAP. Please stay tuned for the URL (will post it in a comment to this blog). For those who understand German I will post a URL to an internet radio interview where wobo talks about Mageia. 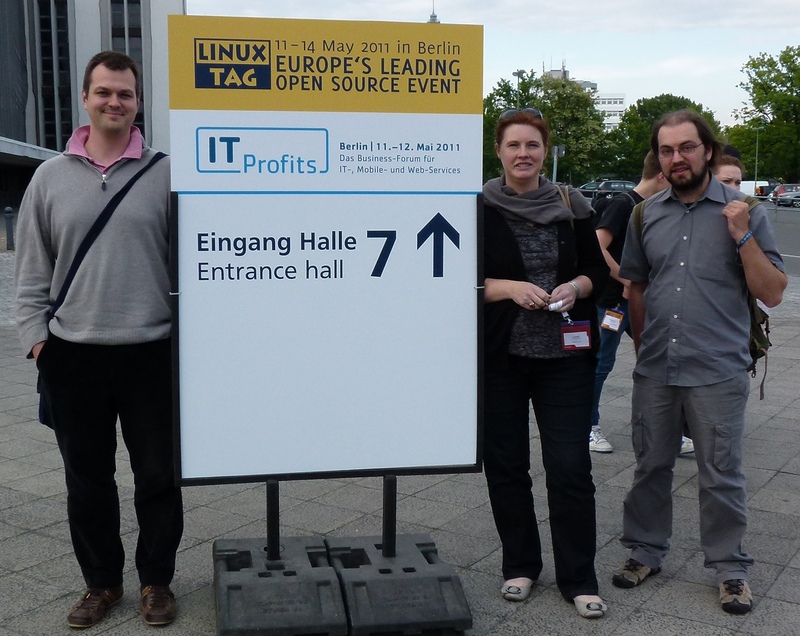 This entry was posted in Uncategorized and tagged Linuxtag, mageia. Bookmark the permalink. Very nice to see some new faces, from whom the names were already familiar for many years. I am sooo late answering this. But yes, that was really great, on so many aspects wobo already explained so well. That was an experience. Thank you so much wobo and obgr for the warm welcome. We need more and more such in situ meetings. Yes, we should try to find an event in automn, so that we have spring meeting at Fosdem, summer meeting in Berlin and automn meeting in ??? (the carribean islands come to my mind). No. It was a shared booth for Mageia.Org and MandrivaUser.de, as has been said in the blog post. The Mageia machines (in the left part of the booth) showed Mageia, the MandrivaUser.de machines (in the right part of the booth) showed Mandriva Linux. Look at the pictures closely. Should I ever accidentally trash my Gentoo system, you can be assured, that I will install Mageia on it 😉 Thanks so much and keep up the good work!